We all met by the roadside before setting off for the nature camp. It was a clear, early-spring morning and several of the children played on a dusty patch of ground next to a run-down factory. We grabbed one of the girls as she ran past. “Do you like it here?” we asked. And off she ran. We watched curiously as the girls piled earth, stones, sticks and leaves together. The child who answered didn’t even look up, being too busy adding leaves to the “cake”. We laughed, but also felt a little sad. It was good to see the children at ease and happy and feeling close to nature. But it was also obvious that it had been a long time since they’d seen any real nature and that they rarely got to play outside; otherwise, they wouldn’t have been so excited about this scrap of land. And – sure enough – when we got to our destination and saw the orchards, grass, ponds and hills, they whizzed off like escaped rabbits. I still feel the same mix of happiness and sadness every time children get out of the car and run off shouting, ignoring any calls to return. China‘s rapid economic development has changed much of the country’s appearance. Childhoods of climbing trees, picking dates and grapes, catching fish, shrimp and tadpoles (or cicadas and crickets), making whistles from willow twigs, and spending all day outside until you were deeply tanned are gone. What have today’s children, growing up with TVs and computers, lost? City kids in China became cave-dwellers in an urban jungle long ago. Children lose the ability to experience nature. They can talk at length about whales or cheetahs, but not describe a flower at their feet. Parents know that if their youngsters eat too much processed food, they will not have a balanced diet; yet they are less likely to know that too much processed information will also hamper children’s development. 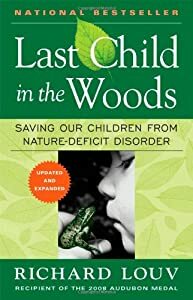 In Richard Louv‘s Last Child in the Woods, the phrase “nature deficit disorder” is used to describe the broken connection between children and nature. And in a rapidly modernising and urbanising China, this phenomenon is spreading quickly. Friends of Nature, formed in 1993, is one of China’s oldest NGOs and has provided links between the urban public and nature through bird-watching and gardening groups. Nature education aimed at children started in 2000, with Green Hope Action and the Antelope Bus. Green Hope Action sees volunteers from the city visit poor villages to provide environmental education. The Antelope Bus is a mobile nature-education project that Friends of Nature adopted from Germany; in its early years, it also visited rural schools. Similar projects include the Beijing Brooks Education Centre’s programme to educate children who live near nature reserves about wetlands. These projects all started in cities and are aimed at rural areas. China’s early NGOs aimed to help vulnerable groups, rather than urban populations that tended to have access to more resources. Over time, however, some of those involved started to question this long-distance approach and to look towards city residents. They found that children in cities had fewer chances to get close to nature than did their rural counterparts – that urban children suffered more of a nature deficit – and so they began to experiment with environmental education in cities. City children (and even some parents), it emerged, didn’t need more knowledge – they just needed to rebuild their links with the natural world. Even an ant can cause both children and adults to panic, says Wu Yue, children’s nature tutor at the Lovingnature Education and Consulting Centre. The ants, worms and lizards we often caught and played with as kids have become terrifying beasts. Similarly, an experiment once found that Japanese university students preferred to play in a concrete gully, believing that two tree-lined mountain rivers nearby were dangerous. Long-term separation from the natural environment causes estrangement, fear and the loss of the ability to appreciate nature’s beauty. As the NGOs worked, they came to understand that while it’s good for a child to be able to name a plant, more is gained if he or she can appreciate its beauty; understand its structure and evolution, its links with other animals and plants; and experience the connection between people and nature. Within two or three years, these ideas gave birth to a range of educational activities based around the observation and experience of nature. These activities include Friends of Nature’s Nature Camps, run by members and volunteers; Beijing Brooks’s nature and art experiences at Waterdrops Camp at its Nature Study Centre in the hills outside of Beijing; Hanhaisha’s community gardens project; and Nature Heart’s classes combining observation, explanation and photography of nature. And we were delighted to see how the children behaved during the activities, breaking down the barriers between themselves and nature; it was like a miraculous journey. Song Xi works on Friends of Nature’s nature experience project. She asked a group of lively children to close their eyes and lie beneath the branches of a large tree. When they opened their eyes and saw the sun shining through the green canopy, they fell silent –as if the whole world had stopped. At first, city kids are unruly and uninterested, but they become curious, excited and focused over time. Initially they don’t want to get dirty and they scream at the sight of a bug – but soon they get closer to nature than their parents do. If they have the opportunity to observe and experience nature, they discover new things, things we may never have noticed, and they become imaginative about things that look ordinary. Nature is ever-changing and full of beauty, and everyone is drawn to appreciate and understand it. It sharpens our senses, stimulates the spirit and cleanses the soul. No matter what their background, all children can find restoration in nature. As Hu Huizhe of Friends of Nature says, even “adults caught up in themselves can feel the power of nature when they notice a dramatic mountain scene or the colours of a wild flower”. Playing outside makes children more fit and coordinated, and helps them to build friendships. The “secret gardens” of our childhood can absorb our sadness, soothe our soul and nurture our lives – and build our future personalities. Activities in the natural environment are not optional; they are an essential ingredient of a healthy childhood, just like sunshine and air are essential for trees and plants. Nature is a treasure-house of knowledge, a palace of art, a spring of imagination and creativity. Children who know how to appreciate beauty will be happier, and creative children will be more successful. In his “Song of the Open Road“, the 19th-century American poet Walt Whitman said: “Now I see the secret of making the best persons; it is to grow in the open air and to eat and sleep with the earth.” Letting children build an emotional connection to nature, to ignite their curiosity and passion – that is the root of all learning. Liu Xinyan is deputy director of the Beijing Brooks Institute. An intriguing discussion is definitely worth comment. I do think that you need to write more on this issue, it might not be a taboo matter but typically folks don’t talk about these topics. To the next! Many thanks!! Pleased you enjoyed this post. To get in touch – see https://environmentaleducationuk.wordpress.com/about-me/ or learnfromnature.net/about.